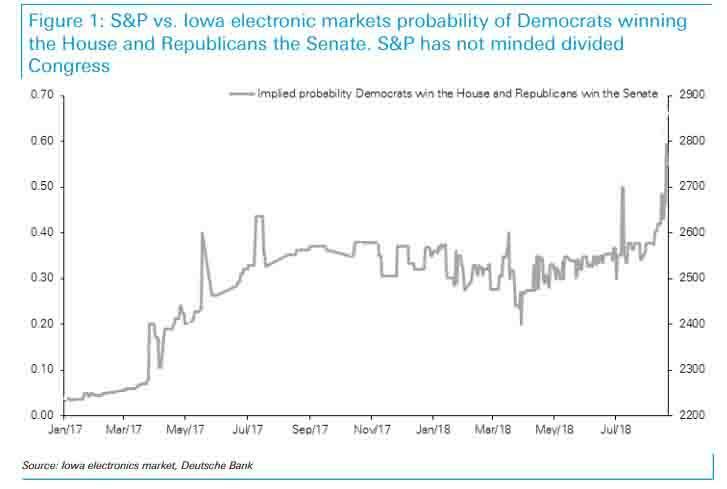 Last week, for the first time the Iowa Electronic Market indicated a majority likelihood that Democrats will win the house even as the GOP holds the Senate. 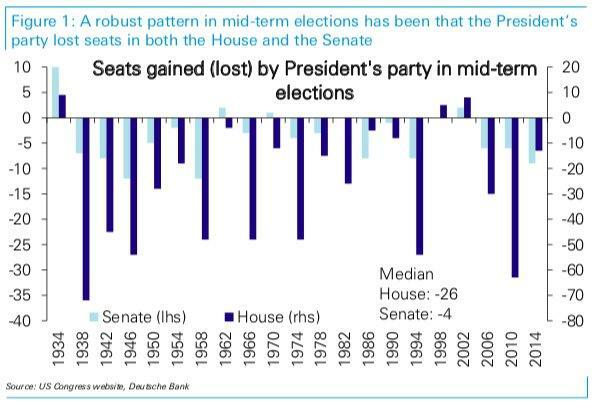 Such an outcome will hardly be a surprise: with even President Trump appearing resigned to a "blue wave" following recent special elections, Deutsche Bank points out that historically the president's party has lost an average of 26 seats in the House and 4 in the Senate: if these patterns hold, the Democrats would take control of Congress. 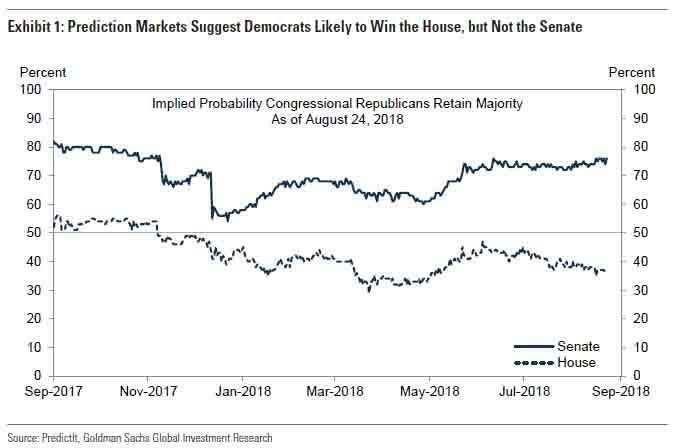 Over the weekend, Goldman economists confirm that public opinion polling and prediction markets continue to imply that the most likely outcome of the midterm election is a Democratic House and Republican Senate majority. 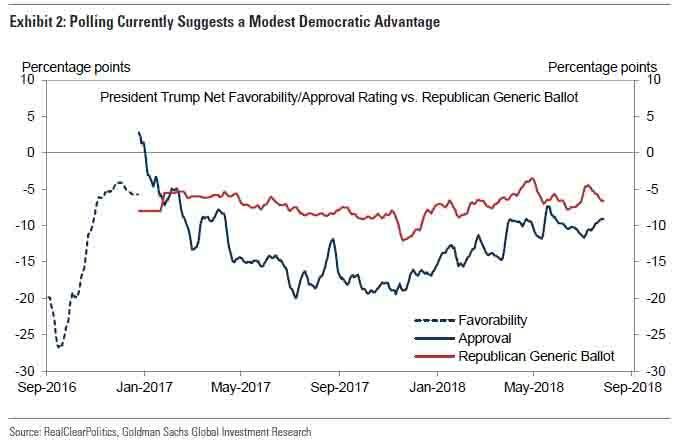 While Goldman agrees with the consensus, it notes that the numbers as they stand today continue to suggest a fairly tight contest. The bank's economists draw attention to generic ballot polling and district-level approval ratings, as they currently stand, suggest that Democrats are poised to win just a few seats more than they need to take the majority. 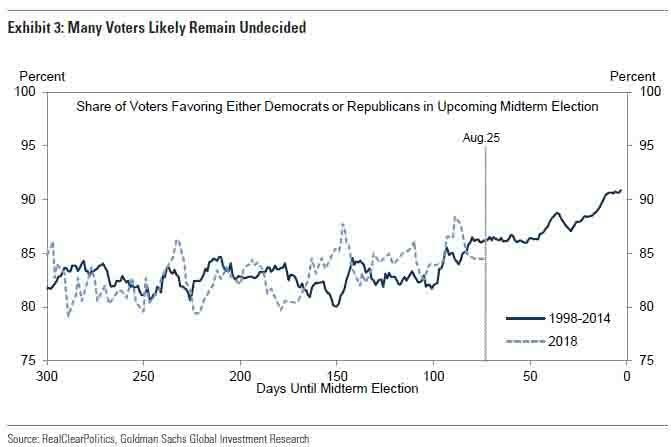 That said, Goldman notes that the remaining undecided vote typically breaks toward the party out of power, and the mainly independent voters who constitute the undecided vote look likely to do so again this year. ... around 15% of voters remain undecided at the moment. Most of these undecided voters are independents. In a recent Economist/YouGov poll, 28% of independent voters had no preference for the House election. These voters accounted for most of the undecided vote, and around 70% of them disapprove of the job the President is doing. To this point, the chart below shows that in recent prior midterm elections about 7% of voters, on average, decide on a vote preference between late August and the final pre-election polling. If this year follows the same pattern and undecided voters split along the same lines as their presidential approval levels, congressional Democrats could add another 2-3pp to their polling advantage over the next couple of months. Most simply, we can look at the relationship between prior generic ballots and the midterm popular vote. A generic ballot margin of -7pp for the president’s party has historically been associated with a loss of around 25 seats, i.e., just above the minimum 23 net gain the Democrats need to win the majority (left panel of Exhibit 4), or around 185 seats (a 55-seat loss from the current level) when estimating the level rather than the change (right panel of Exhibit 4). While the House is likely to flip Democrat, Republicans are likely to preserve control of the Senate, where the hurdle facing Democrats is much higher. The basic story in the Senate is unchanged: Democrats have 10 seats up for reelection in states that President Trump won, while Republicans have only one seat up in a state that Clinton won. Sentiment has shifted somewhat since the presidential election but Exhibit 6, which ranks Republican and Democratic Senate seats by the latest state-level presidential approval rating, implies that President Trump remains popular in many of these states, often more popular than the Democratic senators running for reelection. Assuming the Democrats indeed flip the house, while the GOP keeps the Senate, it opens up several key questions, most notably what it all means for the economy - in the form of fiscal policy and spending, for trade and sanctions policy, for the stock market, and ultimately for the 2020 presidential elections. Below we lay out Goldman's thoughts on each of these key points. Q: What could the midterm election result mean for fiscal policy? On the spending side, we expect less distinction between the parties. 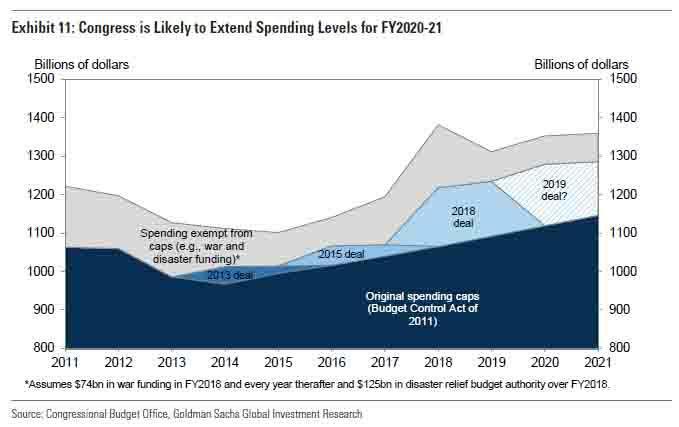 The main variable is the level of discretionary spending (i.e., congressional appropriations), which has been constrained by the caps Congress enacted in 2011. The spending agreement that Congress enacted earlier this year raised the caps on defense and non-defense discretionary spending for FY2018 and FY2019. However, without additional congressional action the caps will revert to their prior lower levels for the final two years they are in place, in FY2020 and FY2021. Unlike tax policies, which can be passed through a simple majority in the House and Senate using the reconciliation process, congressional spending bills require 60 Senate votes to pass. Since bipartisan support is necessary, the spending outcome is therefore less dependent on the composition of Congress. Q: How will the midterm result affect trade and sanctions policy? A divided Congress could lead to incrementally more disruptive outcomes in both areas. If the domestic legislative agenda bogs down, it would be natural for the White House to focus on areas that do not require congressional approval. To date, essentially all of the trade activities the Trump Administration has undertaken have been done without new legislation, under existing legal authority. To the extent that a divided Congress scales back the legislative agenda, we would expect the Administration to become more, not less, active in areas like trade policy. In addition, the political consequences of imposing tariffs—for example, higher consumer prices and lower agricultural prices due to trade retaliation—fade somewhat once the midterm election has passed. Our current expectation, with a 70% probability, is that the White House will impose new tariffs on the majority of the list of $200bn in imports from China it announced in July. The comment process on those proposed tariffs concludes September 5, which could put the White House in a position to finalize plans by late September. We think it is more likely that at least some of these tariffs will be implemented before the election than after, but believe that there will be even fewer constraints to imposing these tariffs after the election if the Administration decides to wait. Like trade, the outlook for sanctions policy is largely independent of the midterm election in our view. The Administration has substantial flexibility to implement existing sanctions law, and recent actions against Iran, Russia, and Turkey have been taken without new legislation. However, the political dynamic differs from trade policy in one important respect. Legislation in Congress regarding trade policy is mostly aimed at restricting the President’s ability to impose additional restrictions, particularly tariffs imposed on national security grounds that the Administration has contemplated using to impose auto tariffs. By contrast, sanctions legislation is generally aimed at increasing sanctions activity. While there is likely sufficient support for both types of legislation, the current Congress looks unlikely to vote on either, in our view, in light of concerns from the Administration. Congressional Democratic leaders would be more likely to hold votes on such issues, which would incrementally increase the hesitance, in our view, to put legislation to a vote despite White House objections. Q: What about areas of potential compromise? An infrastructure program is the most obvious candidate for compromise legislation under a divided government scenario, but we believe the odds of enactment are still fairly low. President Trump has advocated substantial new infrastructure spending during the 2016 presidential campaign, and proposed an infrastructure program in his FY2019 that would spend $200bn over ten years with additional funds from the state, local, and private sector. Shortly after that proposal was released, Senate Democrats offered a plan to spend $1 trillion over ten years, which would be financed by roughly 2/3 of the tax cut enacted in 2017. The approaching 2020 presidential election is likely to make compromise difficult, in our view, as could an increase in investigative and oversight activity that looks likely under a Democratic House majority. Q: How do markets respond to changes in Congressional control? 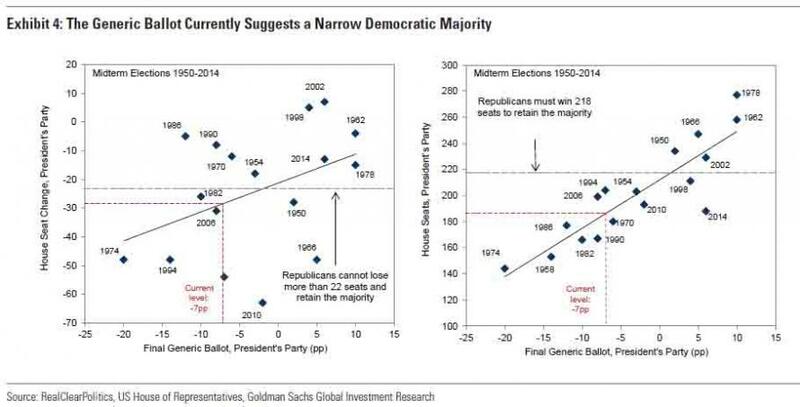 Markets generally do not respond significantly to midterm election results. This is likely because the implications of a change in control of Congress are generally considered less important than those of a change in control of the White House. Additionally, in most recent midterm elections where control of the House and/or Senate has changed, the outcome was well anticipated before the results were known. The median change in the S&P 500 from the close the day before Election Day to the close the day after Election Day has been +0.7% in midterm elections back to 1954. Performance has been essentially the same—a median of +0.8%—in instances in which control of Congress has shifted from unified to divided, or when the President’s party suffers a large midterm loss. Interest rates have declined slightly in such circumstances; the median change in the 10-year yield has been around -0.05bp in when the president’s party suffers a large loss or loses control of at least one chamber of Congress; compared to roughly no change around other midterm elections. 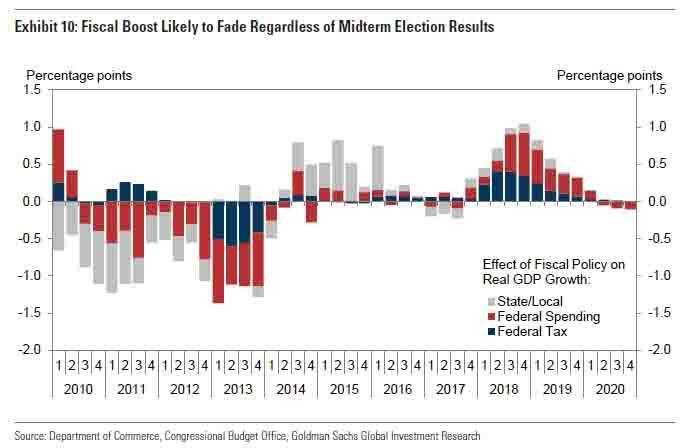 The lack of sharper moves is likely due to the fact that in most cases midterm election results have been well anticipated by markets by Election Day. 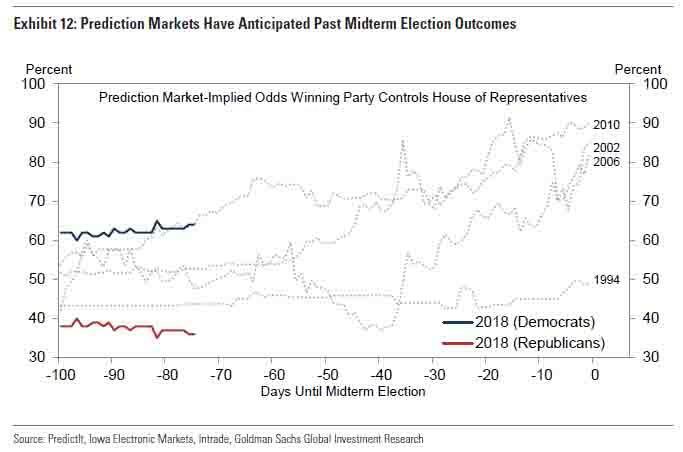 In the 2006 and 2010 elections that turned over the House majority, prediction markets already assigned more than an 80% probability to the outcome on the day before the election. An exception was the Republican win in 1994, when prediction markets and election analysts expected the outcome to be close but the change in control not as widely anticipated as in 2006 or 2010, for example. In addition, the stakes are likely to be perceived to be lower in midterm elections than in presidential elections. In prior presidential administrations, the first two years of the four-year term—i.e., prior to the midterm election—has often been the most productive period for passing major legislation. With less on the legislative agenda following the midterm election, the outcome is likely to be viewed as less important. The composition of Congress in 2019 and 2020 could influence the next presidential election, but we do not believe the results of the midterm election itself hold much predictive power for the next presidential election. Some midterm results have foretold similar results in the next presidential election. For example, large Democratic wins in 1974 and 2006 preceded Democratic presidential wins in 1976 and 2008, and the Republican presidential win in 1968 followed large Republican gains in the 1966 midterm. However, there are plenty of instances in which the presidential result went in the other direction, like Democratic presidential wins in 1996 and 2012 following major Republican congressional victories in 1994 and 2010. 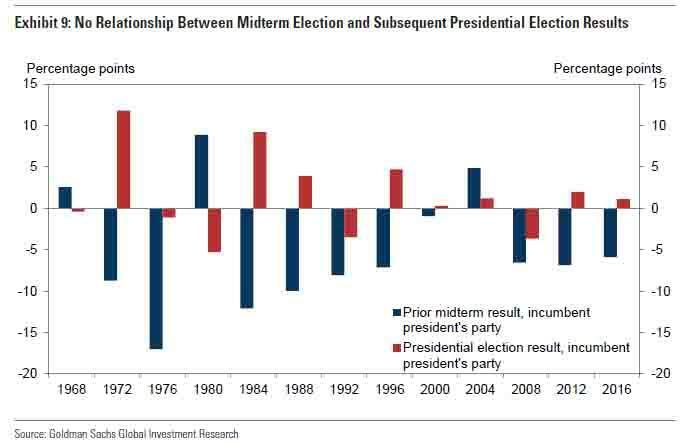 Indeed, simply regressing the prior midterm election result on the outcome of the subsequent presidential election shows a weakly negative relationship; midterm outperformance is associated with presidential underperformance two years later, all other things equal (Exhibit 9). Once we control for economic factors the relationship is positive, but still very weak. 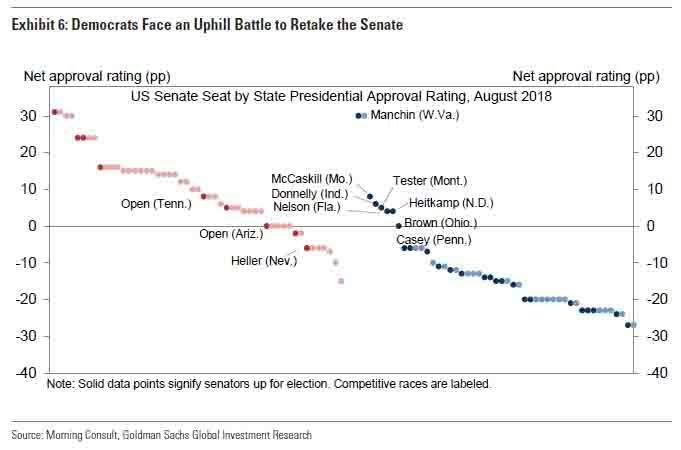 To summarize Goldman's findings, should the Democrats win the House and Republicans hold the Senate, the key aspects of the economy and US politics that would be affected, in order of descending importance are i) trade and sanctions policy, ii) fiscal policy, iii) spending policy, iv) infrastructure policy and v) the outlook for the 2020 presidential election. Meanwhile, absent some unexpected shock, the market will likely ignore most of it.